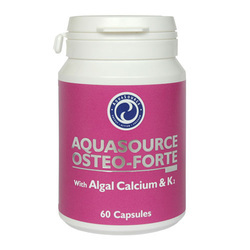 Osteo-forte is an AquaSource product specifically designed to target bone health and strength. It is a synergic combination of naturally extracted calcium, magnesium, Vitamin D, Vitamin, K, ion minerals, digestive enzymes, and afa algae. For an in-depth look at how this product benefits our bones, please read the detailed description below! AquaSource Osteo-forte for strong and healthy bones. Why do we need to take care of our bones? Healthy bones provide us with a wholesome life, but they naturally begin losing density after about 30 years of age. It is exceptionally important that through the food we eat, we provide all the food nutrients necessary for their strength. How strong are our bones? Most people do not know how strong their bones are, but their density and strength could be checked very easily. The most common test is through a low radiation x-ray osteometer (DEXA scanning). There exists another trustworthy method which can be conducted individually at home: the degree of bone change is measured through the bone marker in urine. Another effective method is to have an ultrasound scan of the heel, measuring the bone density. This method gives all the necessary information. There is no worked-out health strategy which would provide examination of the bone density. All is in the hands of the patient and is dependent on his/her attitude and actions. Bones make the skeleton strong and flexible. In any case, the bone shouldn’t be treated and looked upon as passive matter – it is a tissue, made up of living cells, and a net of blood vessels and nerves. The bones represent mineral precipitation around a protein matrix. The most common mineral in them is calcium, which gives them their structure and solidity. Bones constantly break and recuperate. This process is carried through by cells, called “osteoblasts”, which construct the new bone; and “osteoclasts”, which cause “resorption” or bone breakage. The balance within the activity of these two types of bone cells is important for the strength of the bones. The processes of destructing and constructing of the bones is regulated by the thyroid hormones and estrogen. Hormonal activity is mutually dependent on calcium, magnesium, Vitamin D levels as well as other nourishing co-factors in the organism. Bones work as a “bank” of calcium, in which it precipitates and when needed could be extracted for other parts of the body. Proper mineral content of the bones is incredibly important for their strength and un-breakability. Most people know that calcium is necessary for the build-up of healthy bones. Much less known is the fact that Vitamin D and K, as well as the mineral boron and magnesium, are necessary for the proper absorption of calcium. The presence of hydrofluoric acid in the stomach is also very important. Sustaining healthy bones is important throughout our whole life, but it is especially important during menopause when hormonal changes occur. Healthy foods and lifestyle, as well as frequent physical work out play an important role in sustaining density and strength of the bones. Calcium – basic structural component of the bones. Rich sources of calcium are greenleaf vegetables, almonds, hazelnuts, tofu, fine sesame, sunflower seeds and canned fish. Magnesium – vital for moving calcium in and out of the cells. This is the second most common mineral in the bones after calcium, but less attention is paid to it. Magnesium can be provided through almonds, wheat plants, dried fruits and greenleaf vegetables. 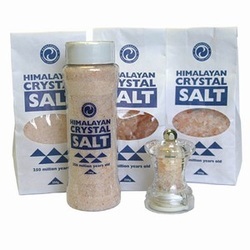 It is important that we provide the necessary amounts of magnesium through our food. Vitamin D – influences and stimulates calcium absorption through the stomach and intestines. It is vitally important for the good use of calcium in the organism. Fatty fish, like tuna fish, salmon and sardines are rich with Vitamin D. The good news is, that a lot can be done to sustain the bones. Providing the nutrients important for the bones through our food, from around the age 35, can help sustain strong and healthy bones. Vitamin K – not long ago, it was discovered that this vitamin plays a very important role in the formation of the bones. It is necessary for the production of osteocalcin - bone gamma-carboxyglutamate (gla) protein, which solidifies calcium. Vitamin K exists in two forms: Vitamin K1 (phylloquinone) – most common within the western-type foods; it is contained within broccoli, cauliflower, brussel sprouts, olive oil, cheese and soy. Vitamin K2 (menaquinone) is much less popular, since its main source is fermented soy, which is more common in the East. Vitamin K2 is absorbed much more easily and is longer-lasting in comparison to K1. While Vitamin K1 is utilized in the body within a few hours, K2 remains active a few days. The intake of alkaline foods, mainly fruits and vegetables, and decreasing the animal protein, protect the organism from raising acidic levels. Sustaining a normal stomach acidity leads to the proper decomposition of the foods providing calcium. On the other hand, high acidity can lead to using the calcium in the bones to decrease its content within the tissue. It is important to eat a lot of foods containing plant estrogen. Asian people, who are famous for their strong bones, take in much larger quantities of these foods than Europeans. Good food sources are: fine linseed (for better absorption), soy, lentils, chickpea, oats, beans, and whole-seed foods. Regular physical activity metabolize the skeleton and raise bone density. Most efficient are pacing, running, dancing, tennis. It is indeed hard to provide ourselves with all the vitamins and minerals through food. That is why eating superfoods is a very good way to make sure we are receiving the important nutrients our bones need. 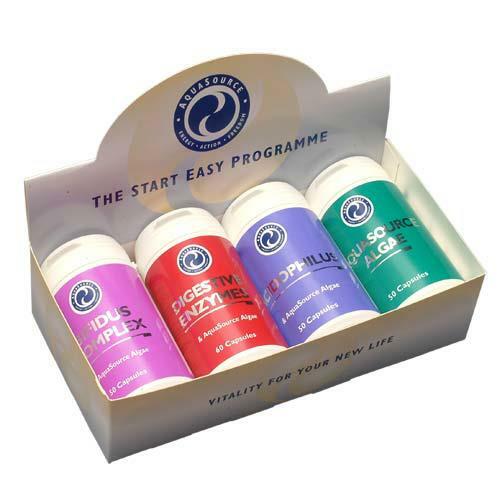 From day to day, the assortment of food supplements become ever greater, which makes the choice even harder. Pay attention to the quantities and form of the vitamins and minerals used, since those are the factors rendering effect on the amount of absorption. The most widespread calcium supplement is calcium carbonate – it works like chalk and is absorbed poorly. What’s more, is that excess quantities of calcium carbonate can be mistakenly built-up in other parts of the organism, like joints, where they can cause calcinations. Magnesium is also commonly found as carbonate, oxide, chloride or sulfate – all of these forms are absorbed in small amounts. 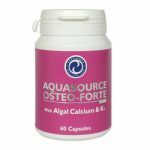 Only two capsules of AquaSource Osteo-forte contain all the food nutrients, necessary for sustaining healthy bones – carefully, scientifically examined, in proportional quantities and in the most bio-available forms. 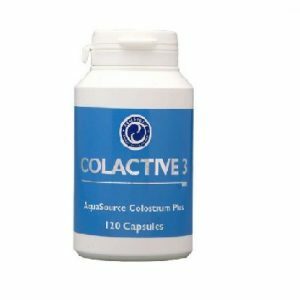 Calcium and Magnesium are contained in significant amounts in this product; extracted from patented scientifically examined algae sources, which have excellent absorption. Algae are gathered alive and are cold-pressed. Minerals are organically connected within them, which makes them especially bio-available. The additional advantage of the algae is that they contain over 70 microelements. Vitamin D – included as D3 (cholecalciferol), which is a lot more bio-available than D2. Boron – this mineral is also included in the content of the product, since it converts Vitamin D in an active form, and its effects on the metabolism of calcium and magnesium are widely examined. Vitamin K2 – extracted from special fermented Japanese soy food, called “Natto”. This is a pioneering step, undertaken with regards to results of most modern research; at the moment, very few supplements contain this newly examined Vitamin K2. Research, made during 2006, shows that Vitamin K2 acts upon the organism’s ability to use calcium by helping its precipitation in the bones. Digestive Enzymes – help maximize the absorption of minerals. Ion minerals – water soluble, naturally extracted from the Great Salt Lake in Utah, USA; provide over 70 different minerals and microelements. They are easily absorbed and help transfer the other nutrients contained within the product. 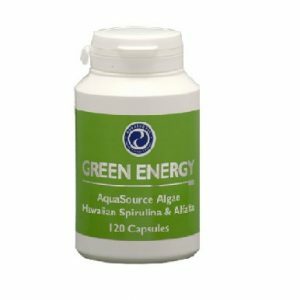 Blue-green AFA algae help raise the food content and synergy of the product. Does not contain gluten, grain foods, wheat, lactose. No added sugar, artificial coloring agents or yeast.